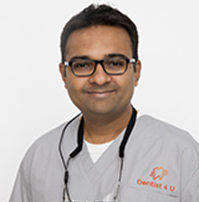 Dr. Ritesh J Barua has many years of experience and has been treating patients in the Illawarra for the last 8 years. He believes in providing professional and honest treatment advice based on the individual needs of each patient. He helps them make informed decisions by discussing in depth the patient’s dental health and all possible treatment options. Dr. Barua is professional, gentle and caring and will go out of his way to make sure his patients are comfortable. He is also great with kids and gives them a positive introduction to dental treatment by creating a happy and fun atmosphere and trying to eliminate any fear of the dentist. He is passionate about your dental health and is dedicated to achieving the best aesthetic and functional result for you. The State of Art Surgery in Fairy Meadow has modern equipment and cutting edge technology to give our patients nothing but the very best. The practice maintains high Standards of Sterilization protocols in line with the AHPRA guidelines. We are committed to continuing improvement by keeping abreast with developments and research in dentistry and incorporating them in our approach and practice. We provide 7 Day Emergency Dental services and late after hours appointments so you can fit your dental care around your working week and not the other way around. We bulk-bill our dental treatment for children eligible under the Medicare Child Dental Benefits Scheme (CDBS), with no out of pocket cost. We offer no-gap dental care for check-ups, cleans & x-rays, for anyone with Dental Health Cover. We strive to provide the best treatment outcome for you and your family to build trust and a lasting relationship. Teeth Whitening, Cosmetic Dentistry, Crown and Bridge, Implants, Oral Hygiene Services, Management of Snoring and Sleep Apnoea, Kidz Dentistry.